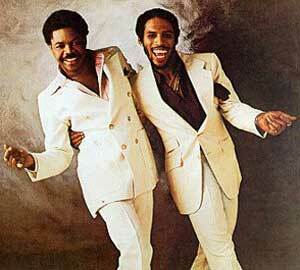 Gene McFadden and John Whitehead are best known for their worldwide hit with the dance anthem "Ain't No Stoppin' Us Now" from 1979. They also composed or produced career-defining tracks for their Philadelphia International labelmates the O'Jays ("Back Stabbers"), Harold Melvin & the Blue Notes ("Wake Up Everybody", "Where Are All My Friends") and Archie Bell & the Drells ("Soul City Walk", "Don't Let Love Get You Down"). In a career stretching back to Stax with the Epsilons vocal group in the 1960s, the duo worked, too, with James Brown, Gloria Gaynor, the Intruders, the Jacksons, Gladys Knight & the Pips, Melba Moore, People's Choice, Teddy Pendergrass, Lou Rawls and Stevie Wonder. In the 1980s, the evergreen "Ain't No Stoppin' Us Now" was used by Philadelphia sports teams and became the anthem of soul weekenders in the UK. It has been covered by the likes of Luther Vandross. McFadden and Whitehead came from the same poor Philadelphia neighbourhood. They went to the same high school and formed a vocal group called the Epsilons with Whitehead's cousin Ronald "Roame" Lowry (later a member of Maze) and their friend Allen Beatty. When Otis Redding came to Philadelphia in 1966, the group attended his concert and met and sang for their favourite soul singer backstage. The Stax star offered them a gig doing backing vocals on tour with him and they jumped at the chance. They sang background on Arthur Conley's smash "Sweet Soul Music", a song Redding had originally earmarked for them, but, when he died in a plane crash in December 1967, the Epsilons floundered. Stax released "The Echo" as a single in 1968 but the group went back to Philadelphia. Undeterred, McFadden and Whitehead recruited James Knight and Lloyd Parks and renamed themselves Talk of the Town for two 45s: "Little Bit Of Your Lovin'" and "Don't Be So Mean" on North Bay Records in 1971. They also began working for the songwriters and producers Kenny Gamble and Leon Huff, who had just convinced Columbia to bankroll their Motown-inspired Philadelphia International Records. Originally recruited as chief mailboy, Whitehead watched and learned from his bosses; soon he was determined to get them to listen to "Back Stabbers", the first song he had written with McFadden. Leon Huff added a piano melody and persuaded the O'Jays to record it. "Back Stabbers" became a hit on both sides of the Atlantic, earning the new label its first gold record in 1972. Over the next three years, Talk of the Town released the very collectable singles "Super Groover (All Night Mover)", "Bumpin' Boogie" and "I Apologize" on the Gamble and TSOP offshoot labels but they eventually split up. Notable among their compositions is the gospel-like "Wake Up Everybody (Part 1)" written with Victor Carstarphen for Harold Melvin & the Blue Notes in 1975. By 1978, McFadden and Whitehead had amassed 22 gold records, two platinum albums and two Grammy nominations but they were itching to record again. "We had been helping other people rocket to the moon." recalled Whitehead. "Gamble and Huff thought we were happy as writers and producers. Finally, they agreed to let us go into the studio record one song. The first thing that came into our minds was: ain't no stopping us now!" They couldn't follow up their huge 1979 smash and "I Heard It In A Love Song" and "I've Been Pushed Aside" were only minor hits before they both signed to Capitol for the "Movin' On" album in 1982. Whitehead subsequently served a brief prison sentence for tax evasion and issued a solo album, "I Need Money Bad", in 1988. He and McFadden reunited for corporate functions and nostalgia shows in the 1990s. John Whitehead was shot dead on May 11th 2004 while working on a car in a Philadelphia street. Gene McFadden died from cancer on January 27th 2006.